By 2020, a quarter of Europeans will be over 60. In their silver age, many would like to stay in their homes and will require care from family or social workers. Unfortunately, the number of caregivers is diminishing year-after-year due to shifting demographics and an increase in working families. This leads to a ‘care deficit’ that poses a major challenge to most European societies. And today’s social workers are often hard pressed, wishing they had more time to connect with the people they care for, rather than the minuted dance of tasks that need to be done. It’s also hard physical work requiring workers to bend over up to 1300 times per shift . It’s an area that is ripe for innovation, enabling both day to day care, and more meaningful human interactions. So, how can robotics technology help as you grow older? 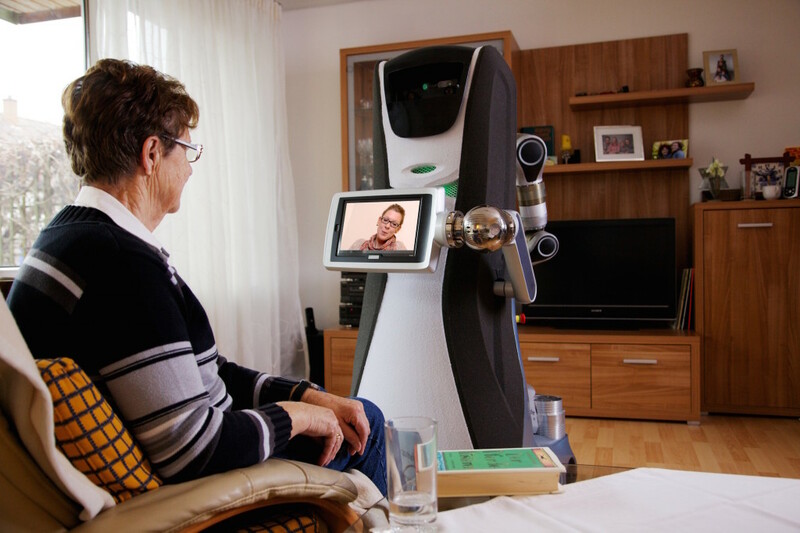 Telepresence robots allow care workers and family to drop by your house remotely. There is no need to pick up a phone, or start a computer. The robot, essentially a videoconference system on wheels, will drive up to you and initiate a conversation. It’s the modern day equivalent of a knock on the door. The idea is not to replace in person visits, but to allow them to happen more frequently, and at the times that matter most. Imagine having your daughter drop by – albeit sometimes virtually – multiple times a day, or being able to ask for help when needed. 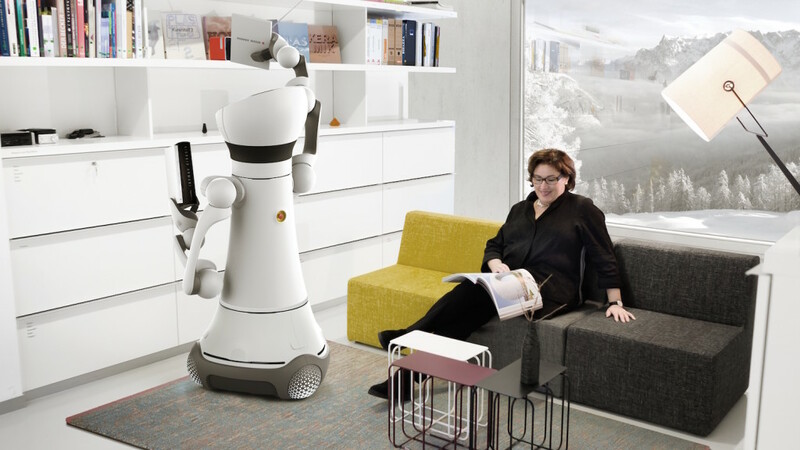 Giraff, a telepresence robot developed through two European Projects (ExCITE and Giraff+) is currently undergoing tests in homes across Europe and is already available for purchase. Reduced mobility is one of the main causes for people joining a care home. Whether it’s walking, lifting everyday objects, eating, bathing, or getting up from a chair or bed. Focus has been on making robots that can help with specific mobility-related tasks. 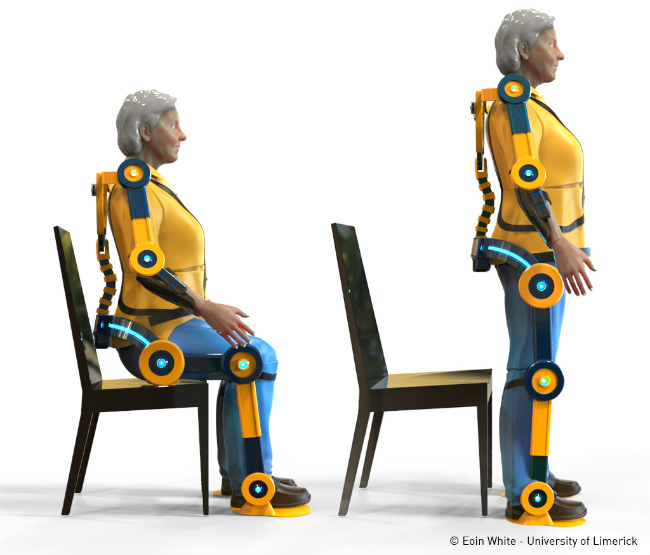 The MOBOT project for example is currently developing an intelligent robotic walker that could help you sit down in a chair, or assist as you move around your house. LEA from Robot Care Systems is also a carebot disguised as a stroller that may help you get out of bed, walk, or hold a cup. LEA also knows about your daily routine, and can sense if you’re not taking medication, eating, or drinking. And Company Besticinc, founded by Sten Hemmingsson who was disabled by Polio, looks at how robots can help you eat. Rather than buy a robot for your home, you may instead be wearing it as an exoskeleton to help with everyday movements. The AXO-SUIT project is providing inroads into developing an exoskeleton specifically adapted to help the elderly move, reach, and grasp. This is not an easy task as special consideration is needed to make the material light-weight, and delicate. In the future, these suits may even feel more like soft smart pants, than rigid bodies made of bolts and metal. The next step is to allow these robots to help around the home. This will require them to have grippers so they can fetch medicine, or a bottle of water. The robots may be remote operated, or may follow your commands in an autonomous manner. This has been the focus of the team behind the Care-o-bot robot. Their robot for assistive living, now in its fourth version, is the result of years of development and more than six related European projects. The team behind the Care-o-bot also worked with CASERO, a robot that can help workers in care homes take over the heavy lifting. The robot can be used to collect the laundry, or carry water bottles around. And if you believe the Robot-Era project, you might even send your robot out to shop for groceries, or pick up a prescription at the pharmacy. However sophisticated the robot, you may find yourself emotionally attached to its daily presence and enjoying its companionship. Human-robot interactions with the elderly need to be carefully assessed to make sure they are providing just the right level of interaction to be as helpful as possible, without being misleading. One of the most successful companion robots to date has been Paro the robot seal developed by AIST in Japan. The robot pet reacts to touch and has been shown to calm dementia patients and improve social interactions. This new form of Robot Therapy has also been shown to have benefits beyond eldercare, including to improve social interactions in children with autism. And why not make your home a robot? A connected home could automatically check that the cooker is off, order food when the fridge is empty, remind you of appointments, and handle the entertainment system. The home may also coordinate a suite of mobile robots, including your vacuum cleaner, or other task-specific helpers. These smart living spaces, which build on the latest trends in Internet of Things, machine learning, and robotics, could deliver on the promise of better care outcomes. Like many robotics technologies, integration is key. To move things along, universities are building dedicating assistive living spaces that will allow them to explore integrated homes in a well controlled research environment. Technology for assistive living leads to real challenges with privacy, ethics, and liability. The act of caring comes with deep responsibility, and potential for harm if not done carefully. In fact, most carebots developed in the laboratory have not made their way to the home. Public acceptance is still quite low, with the latest Eurobaromoter survey on autonomous systems reporting that 51% of European respondents are uncomfortable with having a robot to provide services and companionship to elderly or infirm people. Much of this is due to a lack of exposure to the technology, which will improve as robots become more prominent in the care sector. Thanks to the International Standards Organisation (ISO), there are also new standards for carebots, which should help pave the way for startups and SMEs who would like to enter the sector. 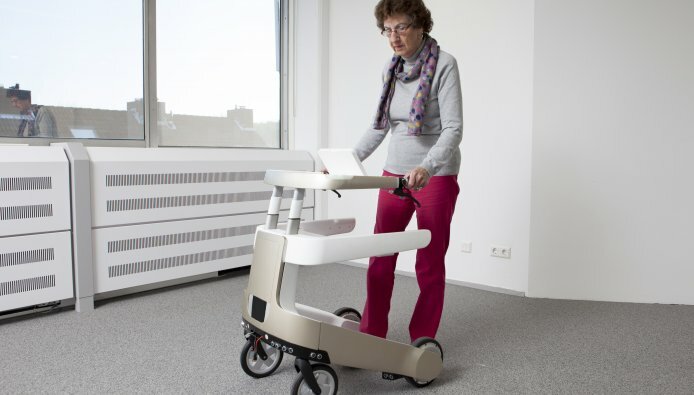 The EU market for robots and devices assisting elderly people is estimated to reach €13 billion by 2016. Given this potential, Europe has been heavily investing in assistive living within the Horizon2020 robotics programmes, and also through the European Innovation Partnership on Active and Healthy Ageing, the Active Assisted Living Joint Programme, and national programmes such as the UKs Long Term Care Revolution project. This is needed as we are still very far from the robot in the movie Frank and Me. Making robots is hard, and we’re just starting to see robots for assistive living leave the laboratory to help with specific tasks such as walking or eating. More versatile carebots still require some work, and most important, plenty of real-word experiments. Fortunately, any developments in assistive living have the potential to improve quality of life for the elderly and carers. And it will become a necessity in the future.